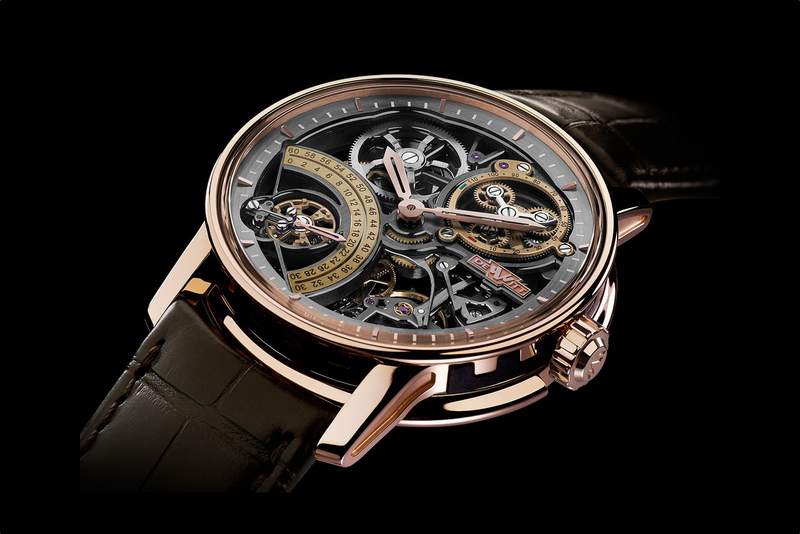 Enigmatic, Genevan watchmaker DeWitt, released a unique, and somewhat peculiar new watch in 2018, called the Academia Endless Drive, which features an endlessly rotating screw in the center of the dial. The watch is inspired by brand founder Jérôme de Witt’s interest in automotive mechanics, and the endless screw is analogous to a car’s drive shaft. “The curves of the screw in unidirectional movement denote an irreversible rotation that fascinates the observer and serves as an allegory for time itself,” according to DeWitt. Technically, the helical screw is linked to the power reserve and winding system. As the 59-hour power reserve is depleted, the screw rotates. And when the barrel is wound, the screw slides on its longitudinal axis. The shaft of the screw is painted green and red at the top, so as to act as a power reserve indicator. In place of hands, on the left and right are two discs that rotate with permanent arrows indicating the time at the traditional 12 o’clock position, one for hours and the other for minutes, respectively. Driving these functions is caliber DW1653 which is based on the company’s standard in-house caliber DW5050 automatic movement. The movement has a variable inertia balance wheel that beats at 3Hz (21,600 vph) and consists of 39 jewels and 320 components in total and visible through the sapphire caseback. Interestingly, DeWitt manufactures their own dials (something very few watchmakers do in-house) and this watch is no exception. 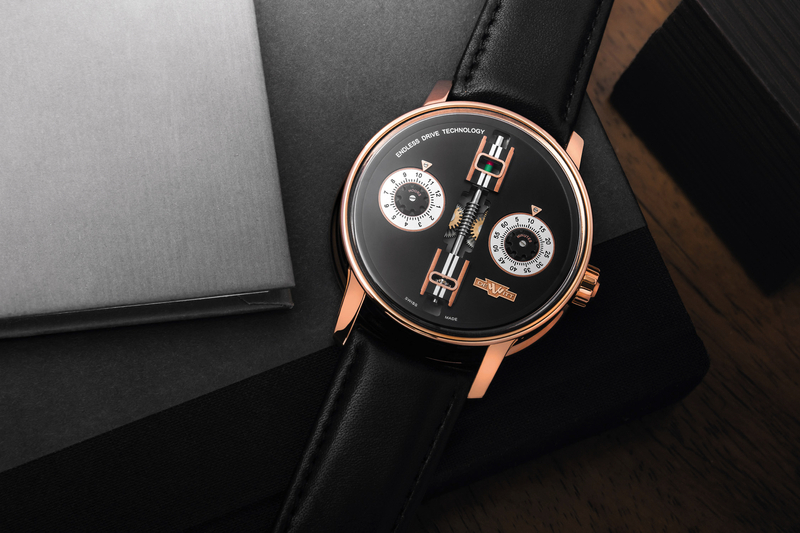 The black galvanic dial has white silvered discs, rose gold hour and minute markers screwed to the dial, along with rose gold accents, including the logo which has been applied to the dial at 4 o’clock. The Academia Endless Drive is housed in a 42.5 mm x 12.85 mm rose gold case with black rubber on the signature cut-out sides of the case. As far as chronometry, I’m not sure this watch design solves any horological problems, or advances watchmaking, so to speak, however, it does achieve the founder’s goal of removing the watch hands to create a distinctive aesthetic on the dial while also linking the watch to his passion for automobiles.